St. Luke’s Hospital, located in North London’s Muswell Hill, was formerly an inpatient mental health hospital, which has been largely unused since 2009. 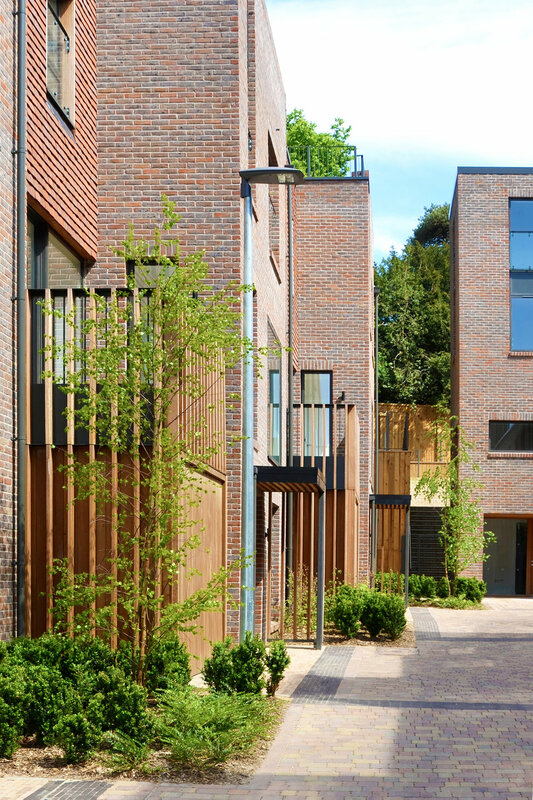 With historic buildings and a location next to Highgate Wood, this residential development presented an exceptional opportunity to create a vibrant landscape that would make a meaningful contribution to the lives of residents, including its community of over 65s. Highly Commended, Development of the Year (More than 100 homes) British Homes Awards (Sunday Times). New architecture is cohered with listed buildings via a landscape that builds upon the existing character of Woodside Square and the adjacent Highgate Wood. The mixture of retained trees and new planting ensure a verdant setting, reinvigorating the sense of place. The scheme encourages social cohesion through public streetscapes, ecological gardens and an ornamental central garden. Paving details within shared surfaces subtly integrate cars and pedestrians, creating a landscape in which people are the priority. A co-housing area has been established within the development, supporting the growth of a distinctive community. Farrer Huxley engaged with members of the group, both pre and post planning, to design a truly bespoke landscape which would expand opportunities to socialize. The landscape for the co-housing community includes allotments (with raised beds to ensure accessibility) and an outdoor social dining space. This is a scheme in which distinctiveness of place emerges both from the physical landscape and the community who inhabit it.